How to DIY your vomit disaters! So you want to know how to remove vomit stains from carpet? We have all been there and this is a question we get asked a lot! Big night out, big night in, the dreaded tummy bug, kids with gastro……..whatever the cause, the result is the same! 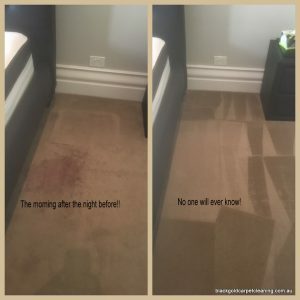 A terrible mess that not only stains your carpet, but also leaves that odour! You know the one, a constant, lingering reminder! The longer you leave it, avoid it, hope it will magically disappear; the harder it will be to remove the stain. Ultimately you need to act fast, but what can you do to remove vomit stains from the carpet? Never leave vomit stains on the carpet. Always attend to them as soon as you can, otherwise the acids in the bile can damage your carpet fibres and leave permanent stains. The liquid will also soak through to the underlay and become even more difficult to remove. The best thing to do is to remove as much of the vomit as possible. Use a flat bladed knife or spatula to scrap away as much of the solid matter as you can. Then blot the remaining liquid with paper towels or clean dry cloths to absorb as much moisture as possible. Baking soda or bi carb soda, as we call it in Australia, is a fantastic cleaning aid. In this situation a fairly generous sprinkling of bi carb soda over the stain will help absorb any remaining liquid and also help neutralise the odour. Leave the powder on the stain for at least 15 minutes before vacuuming away. 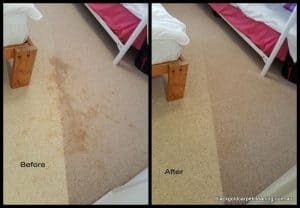 If there is still a visible stain on the carpet, then at this point, you might be best calling in a professional carpet cleaner. Vomit is a protein stain, like blood and urine, so it is best removed with an enzymatic cleaner. This is a process whereby, enzymes digest the protein molecules which cause the stain and odour. You can purchase some over the counter enzyme sprays. Often these types of products are sold for pet stains, but will also be effective in treating human stains as well! 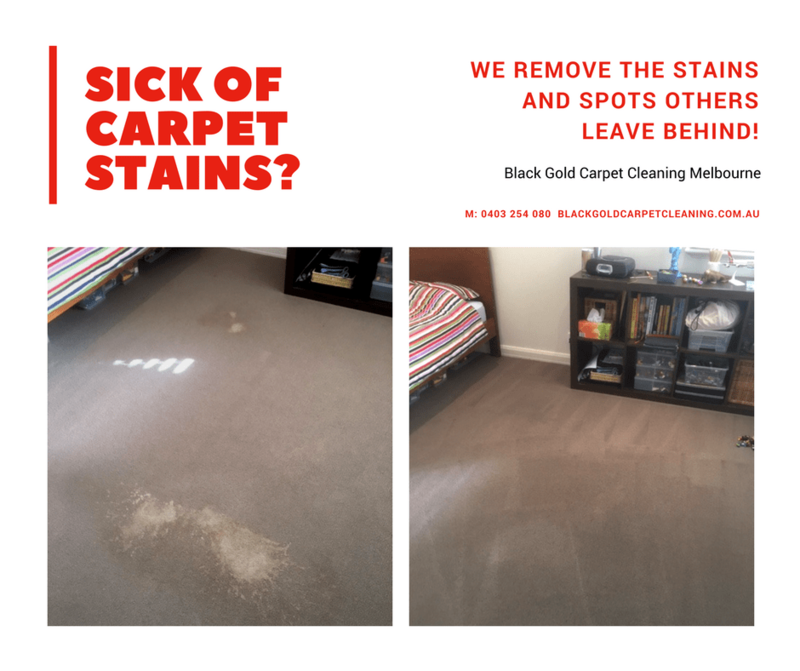 However, professional carpet cleaners are able to select cleaning agents appropriate not only for the type of stain, but also for the type of carpet you have. Some over the counter products may cause more damage to your carpet, particularly if your carpet is made from wool. If you still want to try and DIY the stain, you could try a mixture of one part white vinegar to 2 parts water and a few drops of dishing washing liquid. Make sure you test this on the carpet somewhere inconspicuous first! Mist this mixture over the stain then blot with paper towel or a clean, dry cloth. Whenever you try to remove a stain yourself, it is important to rinse the area with water, after applying any cleaning solutions. Carpet cleaning solutions left on the carpet can cause damage such as bleaching or discolouration. Even “natural” products such as, vinegar can discolour your carpet. Dirt particles also stick to the residue left behind on the carpet and will cause rapid resoiling. Do not use a lot of water or you will end up with brown water marks on your carpet. Just lightly mist water and dab dry. It is important to dab or blot the carpet dry rather than rubbing it, as rubbing, will cause damage to the carpet fibres. I imagine you are beginning to understand why sometimes it is best to leave these jobs to the professionals! Carpet cleaners have powerful cleaning equipment, which can rinse and extract in one motion. They also add an acid rinse to their finish to ensure all residue is removed. All of this can be done quickly and easily with no risk of damage to your carpet. The best way to ensure the stain does not wick back up the carpet fibres after cleaning, is to ensure you dry the area thoroughly. Air movement around the area is vital for quick drying. You can place a fan heater near the area, use a hair dryer or just have a window open and the heating on. Once the carpet is dry, there should be no odour. 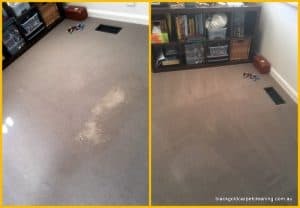 If by this point, you still have a faint lingering odour or stain, I would recommend you call a professional carpet cleaner for advice. In most cases a trained professional can remove stains that the average person cannot. The key to successful stain removal is time! Always act quickly to remove vomit stains using theses tips and ask for professional help if in doubt.